Prince of Persia is a platform game created by Jordan Mechner for the Apple II computer. It has been ported to many of platforms over the years, including the Sega Mega Drive, Sega Mega-CD, Sega Master System and Sega Game Gear. The Grand Vizier Jaffar has thrown you into a dungeon and is forcing the princess of Persia to marry him within the hour. You must escape the dungeon, defeat Jaffar and rescue the princess to become the prince of Persia. The game was revolutionary at the time due to the quality of the animation, and is now considered a classic among gamers. It has also inspired several sequels, starting with Prince of Persia 2: The Shadow and the Flame, and a feature length movie. While all four versions of the game stem from the same source (Jordan Mechner's Apple II version, published by Brøderbund Software in 1989), each of the Sega versions were handled by different teams and arrived at different periods between 1992 and 1993. The game was written in 6502 assembly language for the Apple II, meaning almost every version of the game had to be re-written for the differing hardware. The Mega-CD version was the first Sega port of the game to be released, landing in Japan in August 1992. This version was developed by Bits Laboratory and was originally published by Victor Musical Industries, with Sega handling publishing duties overseas. The Mega-CD version uses similar updated designs and aesthetics as previous Japanese conversions from 1991 (handled by Riverhillsoft and released for the PC Engine, X68000, PC-9801 and FM Towns), albeit with voiceovers in the introduction sequence instead of text. The Game Gear and Master System versions are largely identical bar differences in screen resolution, and, together with the Mega Drive version, were developed as contract work for Domark. Domark's Richard Walker re-wrote the game in 68000 assembly for the Mega Drive, using a version of the source code written in C as a base and the enhanced graphics of the Macintosh version. The levels were re-built by eye by playing the IBM PC version of the game, with a four extra levels created by Jim Blackler. Despite having already appeared on the Mega-CD, the Mega Drive is completely different, with more detailed graphics and a different introduction sequence. Main article: Prince of Persia/Magazine articles. Main article: Prince of Persia/Promotional material. 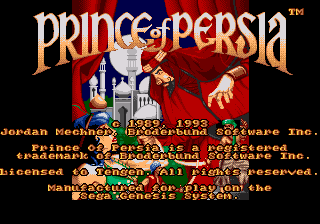 NEC Retro has more information related to Prince of Persia.